I had the greatest childhood of growing up on a country farm with my cousins and grandparents on each side. We had the best time. There were difficult times too when we didn’t get along – especially that time when we were gone to the cattle sale with my granddaddy and Memaw smashed and buried our snake eggs. She hated snakes. 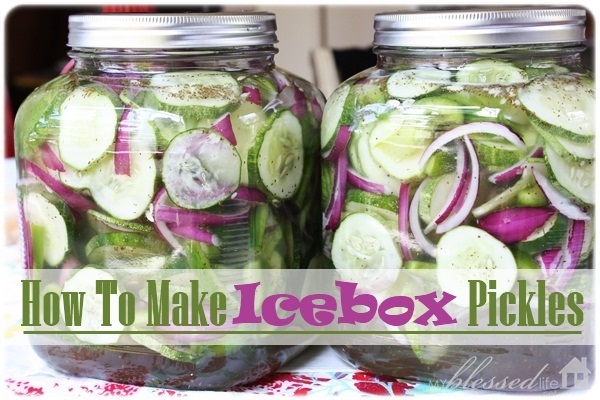 One of the things I remember doing with Memaw is making icebox pickles when there was an overabundance of cucumbers. 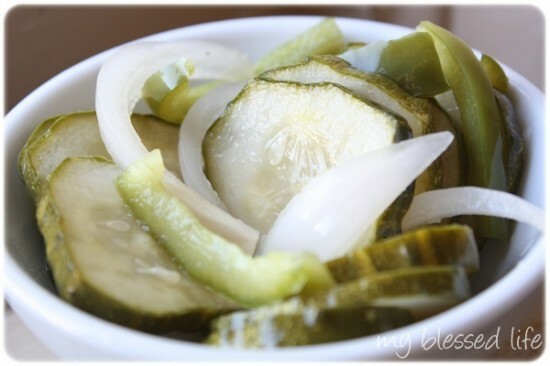 These pickles are so quick and easy to make! Combine all ingredients in a glass jar or crock. Cover with water and refrigerate. You can eat them immediately, but I will tell you that the pickles are much, much tastier if you let them sit in the refrigerator for a few weeks. They will keep up to 3 months in the fridge. Look how colorful they are! The brine has done it’s job! Have you ever made homemade pickles? I’m linking up to Tasty Tuesday, Works For Me Wednesday, Transformation Thursday and I’m Lovin’ It! Wow! They look beautiful! I just love food in jars! haha! I will definitely be trying these. Thanks for sharing! 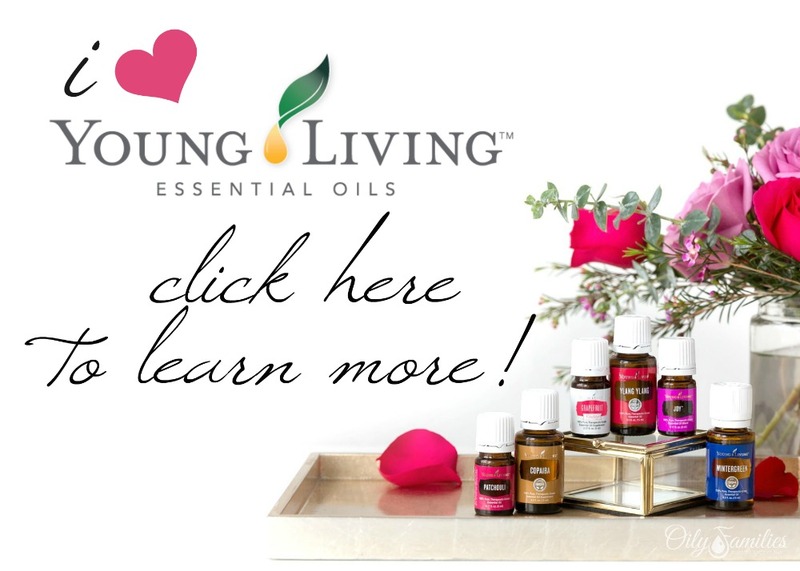 Shona´s last blog post ..Home Sweet Home Featured! how long do they stay good for? My pickles are 5-6 months old, but still taste good. Do they become unsafe or just lose flavor after time? I’ve made pickles before, but it was a bit different: w/o celery seeds, and with a lesser amount of sugar. Will try your recipe soon, BTW some people use boiling water and others just RT – what’s your secret? Jo´s last blog post ..plant Grow lights – What is it? And why it’s so good? My cucumber plants have overtaken my garden. Lucky for me, I love to whip up quick batches of refrigerator pickles (what I grew up calling them), like you do. I’ve eaten my way through the first batch, and on to #2. So much yum! I’d love to make these, but never having put things up before, I’m anxious. What did you mean “cover with water”? Cover the jars and boil in a water bath? Top off the liquid? Thanks! Since they are refrigerator pickles, you don’t have to cover the jars and boil in a water bath…just top off the vinegar mixture with water. 🙂 I hope that helps! So, you just add a little water to fill the jar ? I make these and we can’t wait a month to eat them! I think if we wait 24 hours we have done well. They are delicious! How long will the pickles keep in the refrigerator? I am drooling! How wonderful do those look? Do you think it would mess them up any to add a couple of cloves of garlic? I really like my pickles garlicky. Hi Myra! I made these tonight after I saw your pin. They were so easy to make. It made 4 pint jars. I added some pickling spice in lieu of celery seed. The brine tasted great. It will be hard to wait a month to eat them. Thank you for sharing your family recipe. Blessings to you and your sweet babies Cameron and Ridley. I saw the delicious recipe for pickles……certainly on my list to try this year…..I like to “can”…..on my 5th year, each year I learn more…..I love all you have to offer……love life…..and what it offers……I will be following……soon to want to write a blog or two myself…..time to share my wisdom. I am retired and slightly disabled so this is one of my hobbies, computers: writing, painting, knitting. cooking, and can’t wait: gardening (of which I will be doing lots of container gardening from now on. thank you. I found your recipe on google and then added it to my Pintrest board a while ago as an idea if I ever grew any cucumbers in my garden. I haven’t had a chance to but my neighbor had some HUGE cukes out in front of his house for a small donation. I took my son and let him pick out the cucumber he wanted. So today that’s what we are doing together! This is what I will do with all the cucumbers Hubby brought home from work the other night…Yes! I also add green peppers to this and sometimes carrots. During the summer the peppers make a great addition to burgers. And the carrots are a fun snack for the kids. I do thinner sticks for these. My husband would love these but is diabetic can I substitute a different sweetener? I am curious about the jars.. I love them and can’t find them online. Can you tell me about them. what if you don’t like sweet pickles? Is there a modified recipe for dill pickles? This recipe is for sweet pickles. 🙂 I’ve never done dill icebox pickles. Although it seems quite possible with some dill weed. I made my batch in two one-gallon crocks. They sound great..do they stay crisp? How much celery seeds and salt? I don’t care for green pepper…is there a substitute I could use? I never had the courage to make pickles until I stumbled across Mrs. Wage’s Pickle Mix. It’s in a LOT of grocery stores, Walmart, hardware stores – any place that sells canning supplies. It’s extremely easy, fast, and the pickles are GREAT! One hint – don’t wait till your cukes look like submarines – by then, the seeds are too hard to eat, and the rind has leaked bitterness into the cuke. Oh, and I ran out of cucumber last summer, so I cut up a zucchini and a yellow summer squash I had – they worked just fine. I made bread & butter pickles last year, and added sliced onions, chopped bell peppers, and a couple other modifications to the recipe, with no problems whatsoever. Parboiling (scalding) the cuke slices in boiling water before packing them into the jars means they won’t shrink in the jars while water-bathing them, and you can pack more into the jars. Mrs. Wage’s mixes are very easy – mix up your brine and keep it hot. Prepare your cukes in slices, chips, spears or whatever, pack them tightly in the jars, then cover with the hot brine. Wipe the rims, add the lids & rings, water-bath the proper time for your altitude, remove the jars from the water, wipe them dry and you’re done! They are ready to eat immediately! We love the results, and the mixes come in a variety of flavors to suit anyone. Can these be made without sugar? They look awesome!! For whomever asked about non-sweet, refrigerator dill pickles. These are super-simple, and the recipe can be scaled down easily. Pour brine over cucumbers. Let stand until cool, then cover and store in the refrigerator. Pickles will be ready to eat in a week, sooner if cucumbers are sliced thin. Do you use pickling cucumbers or just regular/english cukes? You said you made your batch in 2-1gl crocks, did you double the amounts on the recipe or did you use what’s listed and divide in two? Just trying to gauge how many 1 qt jars I will need. Please tell me if the sugar is suppose to lay in the bottom of the jar. I have tried to shake it to mix it but it is not mixing. hey myra, I actually made these today, don’t know how they are going to taste yet, but I will let you know. I made exactly 4 qts. the thing that concerned me was adding the water to the jars to top them off. It looks watery, I read some other recipes online and they were exactly like yours, same ingredients and same amount, except, they left out the water and even stated that you will think there is not enough liquid, but that the brine will be just enough. then I read the post on here from the one that had the question about the water, because I thought perhaps I had done it wrong, but you answered that question. So, I am hoping these turn out real good! 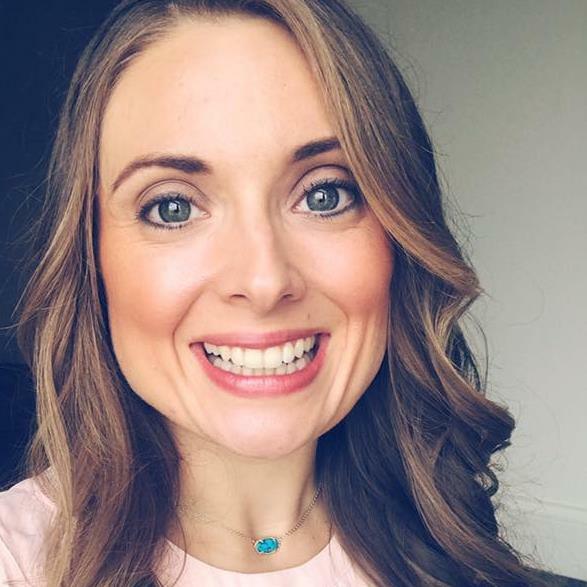 Myra ty. This morning when I got up the sugar was dissolved. I tried 1 this evening and they are delicious. going to try and let them go for a few weeks before eating them TY so much for the recipe. I have added fresh cucumbers to leftover brine. After about a week the brine became bubbly. Is this normal or did I do something wrong? I’m not sure because I’ve never re-used brine. I would probably re-make the brine and then add fresh cucumbers. Do you use pickling cucumbers or regular cucumbers. Thanks, I know what I’m going to be doing this weekend. So… cover with water? Amount?